Who is this Jed Steer Guy? Aston Villa’s Latest Signing. Having brought several of his old backing staff to Villa Park in the past week, Paul Lambert has revisited Norwich City in the transfer market for the first time as Aston Villa manager with the signing of young goalkeeper Jed Steer. With Shay Given certain to move on either permanently or on loan at some point this summer and Andy Marshall having been released after four years without a single first-team appearance for the club, Lambert has moved to bring the 20-year-old to Villa Park to provide back-up to Brad Guzan. 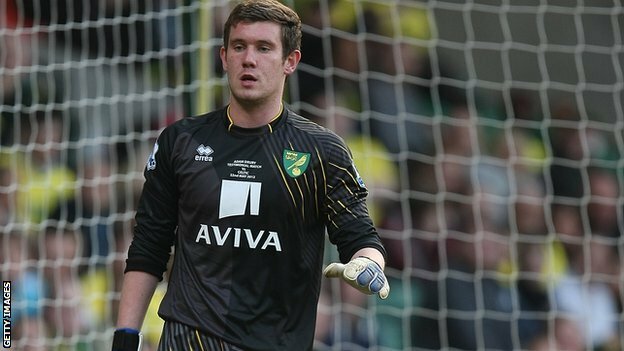 Although Steer never made a league appearance for the Canaries, having just two FA Cup starts in 2011-12 to his name, he is highly-rated by many at Carrow Road, after gaining an excellent reputation through his performances for the youth team. Norwich’s academy manager Ricky Martin once labelled him as the finest young goalkeeper in England. Villa’s new goalkeeper has also been capped at youth level for England, winning five caps for the national under-16 side, seven for the under-17s and two for the under-19s. However, Steer’s only competitive first-team football in 2012-13 was in the form of four appearances for Cambridge United during a month-long loan at the Conference side. But Lambert evidently thinks highly enough of Norwich’s youth goalkeeper to include him in his ongoing revolution at Villa, although his signing can presumably be filed under the heading ‘one for the future’. Having said this, it certainly makes more sense for Lambert to have as back-up goalkeeper a young talent that he knows well and believes can mature into a first-class goalkeeper rather than a declining Given picking up a large wage warming his rear on the bench. Unless Lambert looks to bring in a more experienced goalkeeper as Guzan’s number two for the coming season, Steer will surely be given chances in the Villa first-team in Capital One Cup and FA Cup games next season, so Villa fans hopefully should not have to wait long for the chance to see him in action and to hopefully see in the youngster what Norwich City and the England youth set-up did. Due to his relative lack of game time Youtube links of Steer are pretty hard to come by, but here are highlights of a fine display of his for Norwich’s under-21s against West Brom’s under-21s from last September. Judging by the clip below and the reputation he built at his previous club, Lambert has brought in a talented young keeper with the potential to develop in to a potential successor to Guzan in the long-term.